We first met Rufus when he was 13 weeks old. It was love at first sight! For the next 12 years he would be my constant companion. He was a tiny pug who had trouble climbing steps and would stumble when he ran. But he soon found his bearings and there was no stopping him then! From day one he has slept in my bed. I was so afraid I would roll over on him but he snuggled right next to me. Rufus loved being outside in the sun and belly up. We met so many nice people and their pets during our walks. He would run when I tried to put his harness on even though he loved his walks. He would hit me with his paw whenever he wanted a treat or for me to continue petting him. He grew up with my boys and payed by their side when they were sick and gave them a run for their money when he would do a “pugtona” in the back yard. He loved his cheerios and mostly his dog toy Frankie. That beat up toy went on all our vacations and he couldn’t sleep without it. There wasn’t a single person who met him that didn’t fall in love with him. His silliness and velvet ears sucked you right in! He helped me through my dads passing, my sons deployment, my other son leaving for college, sicknesses and breakups. Always at my side I called him my Velcro dog. I felt at ease when he would lay down next to me on the sofa and in bed. 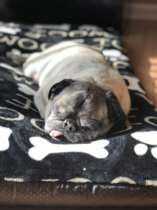 His pug snoring made me smile. He would look out the window as I pulled up from work and greet me with his curly tail wagging. He loved me unconditionally as I did him. He loved to watch tv but would boof at animals on the tv. Sometimes even try and get them! He loved the snow and running in it. Sadly the day my sweet baby passed it snowed. It’s so quiet without him and I miss him terribly.